Film legend Gloria Swanson as Norma Desmond, an aging silent film queen, and William Holden as the struggling writer who is held in thrall by her madness, created two of the screens most memorable characters in Sunset Boulevard. Winner of three Academy Awards, director Billy Wilder's orchestration of the bizarre tale is a true cinematic classic. From the unforgettable opening sequence through the inevitable unfolding of tragic destiny, the film is the definitive statement on the dark and desperate side of Hollywood. Erich von Stroheim as Desmond's discoverer, ex-husband and butler, and Nancy Olsen as the bright spot in unrelenting ominousness, are equally celebrated for their masterful performances. While I hate to admit this, I will: I never saw Sunset Boulevard before its DVD arrived in 2002. Though I had some general understanding of the plot and characters, that was about it. Much of it offered a fresh experience for me, and I found it to provide a lively and intriguing film. Sunset starts with its end, as we see a dead man floating in a pool. We then go back to the beginning and find out what happened. We meet struggling screenwriter Joe Gillis. He needs three hundred bucks to keep his car, so he hits his contacts to scrape up some work. He heads to Paramount to push a producer named Sheldrake (Fred Clarke) to take his story pitch. That fails – no thanks to story consultant Betty Schaefer (Nancy Olson), who dislikes his plot – so he shoots for a personal loan. That and other attempts also flop, so Joe finds himself just about ready to head back to Ohio and his old newspaper job. Other events intervene, however. Joe boogies away to escape the repo men, and when a tire blows, he ends up in the driveway of a fancy old mansion. Joe believes the building to be abandoned, but he soon discovers otherwise as he meets faded silent film star Norma Desmond (Gloria Swanson) and her no-nonsense butler Max (Erich von Stroheim). They represent all the inhabitants of this lavish abode, though they currently plan to put to rest a former resident: a chimp. Norma thinks Joe’s there as the monkey coroner. When she decides otherwise, the pair chat, and we find that Norma wrote a screenplay based on the Salome story intended for her return (Norma hates the term “comeback”). Joe reads the terrible text and feigns interest in it to gain a job as its editor. Eventually, this leads him to move in, and he quickly turns into Norma’s boy toy. Joe doesn’t take to this role well, which leads him to flee during her creepy New Year’s Eve party. 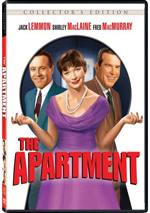 He ends up at another party run by his friend Artie (Jack Webb), where he again meets Betty. Although she’s dating Artie, clearly some romantic sparks fly between Betty and Joe. However, those fail to ignite when Joe finds out that Norma attempted to kill herself after he left her party. Joe rushes from Betty’s side to return to his sugar momma. This puts him back into his old submissive position. Betty tries to get in touch with him to work on one of his story ideas, but he remains isolated in the mansion with Norma. The plot thickens when Max delivers Norma’s script to Paramount, and they need to deal with its reception. Eventually, Joe does connect with Betty again, which complicates matters even more heavily. I won’t go any farther than that. It seems to me that anyone who paid attention to the film’s first five minutes will know how it’ll end, but I could be wrong. In his audio commentary here, film historian Ed Sikov professed that he didn’t expect the conclusion at all, so others may also feel startled by those events. I remain confused how that could happen, but I’ll err on the side of caution and halt my synopsis now. Not that I need to convey more information to let you know what a cool experience Sunset Boulevard offered. I don’t know about others, but I tend to view movies created prior to the Sixties or Seventies as lacking the bite and nastiness found in flicks from more recent days. Sunset shows just how wrong I am, as it offers a gloriously cynical piece of work. I also always thought that only more modern efforts became self-referential and exposed the inner workings of the movie industry. Sunset may not be as obsessed with the topic as something like The Big Picture, but it delved into that subject in a vicious way. It didn’t treat Hollywood with kid gloves. Instead, it launched into a bitterly comedic exposé of the business’ tendencies, which made it surprisingly sharp and snippy. Sunset didn’t succeed just because it bit the hand that fed it. After all, The Big Picture pretty much flopped when it took on somewhat similar territory. However, writer/director Billy Wilder created something tremendously crisp and lively here. He provided dialogue that alternated between hard-hitting and florid. Most of it didn’t seem like speech you’d hear in real life, but I didn’t care. Wilder’s dialogue offered such delightfully cutting and dynamic material that I could total forgive the lack of reality behind it. It helped that Sunset enjoyed terrific performances across the board. The movie featured a confrontation between styles. Holden’s naturalistic approach butted up against Swanson’s lavishly theatrical tendencies, and the results seemed surprisingly well integrated. Swanson achieved her own “return” from obscurity with her marvelous work as Norma. Of course, she appeared tremendously over the top, but that worked splendidly for the larger the life – and nutty as a fruitcake – Norma. Alternately imperious and haughty and sad and pathetic, Swanson made Norma a force of nature. If nothing else, she offered some of the most fascinating line deliveries in history, with pronunciations like “sit dowwwwnnn” and “gay-rage”. Even had the source material stunk, the film would have remained interesting due to Swanson’s presence. But with the talents of Billy Wilder at the helm, Sunset Boulevard never threatened to require the actors to make it succeed on their own. Surprisingly cynical and blunt given its era, the movie shredded the movie industry and also offered a deep and vigorous character drama. The best work created by a legendary director, Sunset Boulevard merits its status as a classic. 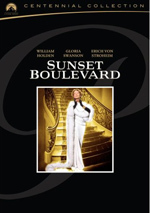 Sunset Boulevard appears in an aspect ratio of 1.33:1 on this single-sided, double-layered DVD; due to those dimensions, the image has not been enhanced for 16X9 televisions. Though not without some flaws, the flick usually looked very good. Sharpness looked excellent. The movie presented a consistently tight and concise image. I noticed virtually no signs of softness during this distinct and detailed presentation. A little shimmering occurred at times, but nothing distracting. The movie lacked any signs of jagged edges, and I also detected only mild examples of edge enhancement. The black and white image demonstrated solid tones. Blacks came across as deep and rich throughout the movie, and it offered simply terrific contrast at all times. The film displayed a nicely silvery appearance that seemed fantastic. Shadow detail looked appropriately heavy but never came across as excessively heavy. Though not totally immaculate, given the age of Sunset, the movie suffered from relatively few source flaws. I noticed some light grain on occasion and also came across a few print defects. I detected a smattering of specks, hairs and marks as well as sporadic blotchiness. Don’t worry too much about these, though, as they played a small part during the mostly clean presentation. Overall, I felt very pleased by this fine transfer. While not in the same league as the picture, the monaural soundtrack of Sunset Boulevard also worked acceptably well given the age of the material. Speech seemed reasonably accurate and distinct, with no issues related to intelligibility or edginess. The lines could sound a little flat at times, but they demonstrated no significant concerns. Music came across as fairly bright and lively, though dynamic range seemed limited. Effects also displayed generally accurate tones but lacked very clear highs or tight lows. Some bass response appeared, but it sounded a bit boomy and heavy. I noticed some light background hum and a little noise, but these issues remained relatively modest. Overall, the audio appeared decent but not spectacular. How did the picture and audio of this 2008 “Centennial Collection Edition” compare to those of the 2002 Special Edition? I thought both seemed virtually identical. Because most of the new disc’s extras appeared on a second platter, it had a little more room to breathe, so it might’ve been slightly tighter. However, any improvements were minimal, as both discs looked and sounded very much alike. In terms of extras, this “Centennial Collection Edition” mixes new components and elements from the 2002 SE. I’ll note 2008 exclusives with an asterisk. If you fail to see a star, that means the component also appeared on the old disc. 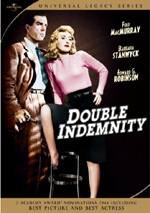 DVD One starts with an audio commentary from Billy Wilder biographer Ed Sikov, who offers a running, screen-specific piece. Sikov provides an inconsistent track. At times, he tells us some good background information. He goes over the deleted opening segment as well as background for many of the participants and inside information that modern audiences might need to better understand the film. Unfortunately, Sikov often simply tells us the on-screen action, and the piece also suffers from way too many empty spaces, especially during the movie’s second half. I dislike those gaps under any circumstance, but they’re particularly bothersome when they come from a film historian. Sikov could have covered many topics related to the filmmakers that would have filled the commentary, so the many empty sections make this track sporadically useful but often frustrating. DVD One also includes a *Preview for It’s a Wonderful Life. With that we head to DVD Two and a slew of featurettes. *“Sunset Boulevard: The Beginning goes for 22 minutes, 45 seconds and provides movie clips, archival elements, and interviews. We find remarks from Sikov, Paramount Pictures producer AC Lyles, actress/companion of William Holden Stefanie Powers, filmmaker/author Nicholas Meyer, film historian/critic Andrew Sarris, and actors Gloria Swanson and Nancy Olson. The program looks at the movie’s screenplay, its casting and performances, and its costume designer. We learn a lot of nice details here, and Olson provides some fun anecdotes; her presence adds a lot to the piece and helps make it a good one. Genre topics come up in *The Noir Side of Sunset Boulevard by Joseph Wambaugh. During this 14-minute, 19-second piece, we discover notes from author Wambaugh. He discusses his experiences with the flick and gets into interpretation of it and its place in the film noir genre. Wambaugh proves interesting and insightful. We explore the movie’s legacy with *Sunset Boulevard Becomes a Classic. It goes for 14 minutes, 28 seconds and contributes comments from Sarris, Swanson, Sikov, Olson, Meyer, Powers and Broadway Norma Desmond portrayer Glenn Close. We find some thoughts about the movie’s reception and its legacy. I’d have liked more specifics about how the film was viewed back in 1950, but we get enough material on both sides to make this a satisfactory piece. For a look at the lead actress, the 10-minute and 36-second *Two Sides of Ms. Swanson features Swanson’s granddaughter Brooke Anderson and Airport 1975 costar Linda Harrison. They offer reflections on Swanson as a relative and as an actor. Because we only hear from the two of them, we don’t get a broad glimpse of Swanson, but we do learn some interesting facets of her personality. Next come some *Stories of Sunset Boulevard. It runs 11 minutes, 21 seconds and includes Sarris, Sikov, Meyer, Olson, Powers, Swanson and Lyles. This show covers the abandoned original opening, camerawork, performances, thoughts about Billy Wilder and the script, and some scene specifics. Though it feels like a repository for interview snippets left over from the other featurettes, but that doesn't become a problem. We still find a lot of interesting details, so the program works. We learn about the main actor in *Mad About the Boy: A Portrait of William Holden. This one goes for 11 minutes, 12 seconds and provides remarks from Lyles, Powers, Olson, and Wambaugh. “Boy” provides some info about Holden as a costar, but it mostly focuses on his personality and personal life. Like the Swanson piece, “Boy” is too short to offer a strong examination of the actor’s life, but it throws out enough good tidbits to succeed. Information about the music appears during the five-minute and 51-second *Recording Sunset Boulevard. It gives us statements from Sarris and soundtrack album producer Robert Townson. Most of the short program looks at the 2002 re-recording of the score produced by Townson. We don’t really learn much about the movie itself, so this turns into a mediocre piece. Geographical details appear in *The City of Sunset Boulevard. This one runs five minutes, 36 seconds and offers notes from Sikov, Olson and Los Angeles Attractions author Borislav Stanic. We get a decent little tour of the movie’s locations here. Sets come up in the five-minute and five-second *Behind the Gates: The Lot. Here we hear from Lyles and film historian/author Rudy Behlmer. The show covers basics about the origins of Paramount and its studio location. As with some of its predecessors, it’s way too short to truly satisfy, but we do find some interesting facts. More info about the studio shows up during the nine-minute and 37-second *Paramount in the ‘50s. It simply shows us clips from a few of the studio’s biggest flicks during that era. A narrator provides some remarks about the movies as well, but nothing particularly revealing emerges here. Instead, the show feels more like a long ad for the studio. Edith Head – the Paramount Years provides a 13-minute and 42-second look at the famous costume designer. We see movie clips, archival materials and photos, and interviews with Head biographer David Chierichetti, costumer Tzetzi Ganey, fashion designer Bob Mackie, and actress Rosemary Clooney. Chierichetti dominates the program, which offers a quick but solid discussion of Head. We learn about her early career, her own personal style, and a lot of the work she did for flicks like Sunset and To Catch a Thief. “Head” gives us a reasonably full glimpse of the legendary designer. During the 14-minute and 28-second Franz Waxman and The Music of Sunset Boulevard, we hear from film music historian – and composer’s son – John Waxman plus composers Elmer Bernstein and John Mauceri. Fairly similar to the Head program, this one covers Waxman’s early life and career and explores some of his films, though it delves particularly deeply into his material for Sunset. Overall, it offers another entertaining and informative featurette. A cool little feature, the Hollywood Location Map covers some of the spots seen in Sunset Boulevard. It goes through these sites: Schwab’s Drugstore, Joe Gillis’ Apartment, Norma Desmond’s Car, Paramount Pictures, and the Getty Mansion. Paramount splits into three smaller areas: Bronson Gate, Dreier Building, and Stage 18. Each of these shows footage from the film while we hear narration that provides notes about each of the locations. The various clips last between 19 seconds and 52 seconds for a total of three minutes, 51 seconds. Though this domain badly needed a “Play All” option – it gets tiresome to constantly return to the main menu – it still offers enough good material to merit a look. To get a glimpse of the film’s unused original opening, check out the Morgue Prologue Script Pages. This shows both the original morgue prologue from December 1948 and the revised morgue prologue from March 1949. In addition to the text, the original sequence offers looks at the filmed shots themselves. Unfortunately, they lost the sound for those clips, so they remain silent, but this area nonetheless offers a cool look at a major deleted sequence from Sunset. In addition to the flick’s theatrical trailer, Sunset concludes with Photo Galleries, where we discover three subsections. We find stills for “Production” (46 shots), “The Movie” (25 images), and “Publicity” (16 photos). All three areas seem good, with the best pictures appearing in “Production”. However, some of the “Publicity” stills are cool as well, if just to see von Stroheim’s facial expressions. Finally, the set includes a *booklet. The eight-page piece provides some short production notes and a few photos. It’s not memorable but it’s a nice way to finish the set. Does the 2008 “Centennial Collection” release lose anything from the 2002 Special Edition? Yes – it drops a documentary about the movie. However, because the 2008 version packs so many new featurettes, it more than compensates for that loss. A movie that merits the designation “classic”, Sunset Boulevard provides an unusual and memorable experience. Director Billy Wilder bites the hand that feeds him in this lively and cynically compelling look at Hollywood. The DVD offers strong picture quality along with decent audio and a positive roster of supplements. Sunset Boulevard comes to DVD in great shape, and I highly recommend this terrific movie and solid disc. For viewers who don’t already own the 2002 release of Sunset Boulevard, this 2008 “Centennial Collection” version is the one to get. However, I’m not sure it merits a double-dip for fans who bought the prior disc. Sure, it presents a nice array of new extras, but the movie looks and sounds pretty much the same on both discs; you’ll not find any real improvement with the 2008 transfer. Serious fans may want to drop the extra bucks for the new supplements, but others will remain happy with the original release.